I’m already busy, why do I need telemedicine? Think you have a full plate at the office? Rather than being just one more thing to do, telemedicine can actually help you clear some room. 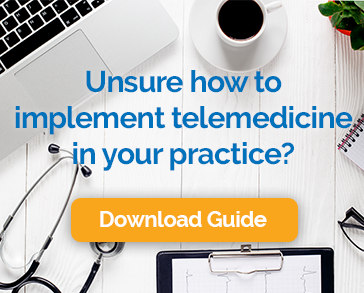 Even if you don’t feel the need to expand your practice by seeing more patients each week, telemedicine can still offer some significant benefits. Here are a few. In other words, get paid for work you’re already doing. Telephone follow-ups to check on patients after a visit or to review lab results are generally not reimbursable. In many cases, simply adding a video element to those calls can turn them into reimbursable encounters. Thirty states require private payers to reimburse providers the same for telemedicine visits as they do for in-office ones. Twelve other states are considering similar legislation. Even in states that don’t have these so-called “parity” laws, some private insurers reimburse for telemedicine because they believe it to be cost effective and good for patients. The Medicare Chronic Care Management program also offers an opportunity to increase revenue by receiving reimbursement for care of Medicare patients with three or more chronic conditions. Telemedicine eliminates many of the barriers that keep patients from complying with instructions to come in for a follow-up visit. A video visit does not require time off work or away from family obligations. It eliminates travel time and expense and cuts out time wasted in waiting rooms. When patients follow-up as instructed, health outcomes improve. You are in a better position to ensure that treatment is progressing as expected and spot any concerning symptoms before they become serious. Video visits are also ideal for lifestyle related treatment like weight loss and smoking cessation. Work/life balance is as important, if not more important than revenue for many physicians. Because telemedicine visits can be done from anywhere, they offer a whole new level of flexibility. Some providers enjoy working from home one day or afternoon a week. Another option is to schedule telehealth visits during non-traditional office hours to free up time during the work week. Traveling is also easier if you know you can still check in with patients if necessary. A lot of articles produced about the benefits of telemedicine are focused on providers, but video visits are great for office staffs as well. Teams become more efficient because the daily burden on front desk attendants and clinical staff is reduced. In addition, fewer patients in the office means less exposure to illness. This is especially true during flu season. Telemedicine also helps practices run on schedule by reducing the total appointment length with a video encounter. Calmer, less crowded waiting rooms are also a welcome change for medical office staff. The most valuable thing in your practice your time. Last minute cancellations and no-shows waste this valuable resource and hurt profitability. The option of video visits helps tackle this problem in a number of ways. Patients with a telemedicine visit are less likely to cancel due to work issues, transportation, child care, and all of the other facts of life that make getting into the office difficult. If a patient has an in-person visit scheduled, but something comes up that prevents them from showing up, you may be able to do the visit remotely and avoid the cancellation. Sometimes patients simply forget their appointment, a situation that can often be remedied by switching to video. According to a recent study conducted by Cisco, nearly 75% of patients are in favor of using telehealth services to treat their medical conditions and better communicate with their healthcare providers. Other research reveals even more findings of consumers confirming some level of increase in their healthcare satisfaction as a direct result of telehealth services. This isn’t surprising given that the things patients are most dissatisfied with include long wait times, traveling long distances to see specialists, crowded ERs, and unnecessary absences from work. All convenience issues that can be resolved with telemedicine. Instead of thinking of telemedicine as one more thing to do, consider it a better way to do some of what you are already doing. It’s great for the bottom line, welcome news for patients and staff, and an easy way to give yourself more time and flexibility.